LumosJared x10: Individual Direction, Recruitment, Paperwork. SpunSugar x21: Codex, Wiki, Individual Direction. MadamAries x1, CnocBride x5, Spectriel x1, Winterless x1, lunarepiphany x1, 65jes89 x2, Zacatero x3, Jaehaerys x1, : Game Tickets.  CnocBride x1, Winterless x1, 65jes89 x1, Zacatero x1, MokeDuck x1, falconhand x2: Help Chat Responses. Sephite x2, CnocBride x2: Ban Appeals. Sephite x1, CnocBride x1: Survival Investigation. CnocBride x1, Zacatero x2: Trunk Storage. falconhand x7: Lore Item Documentation. Zacatero x1: Event Proposal and Research. CnocBride x1: CoK Relaunch Post. CnocBride x1, falconhand x1: Rank 1 Training. SpunSugar x12: Various Regalia spots. Billythescroofy x32: Processing and Sheets. Hydralana x65: Sheets, Writing, Processing. SpunSugar x8: Meetings, Leaf Decay, Event posts. Seoulmate x6: Weekend Roundup + Postings. CS_Birb x22: Various Tech Tasks, Discord, etc. TheComputerGeek x12: Various Tech Tasks, MassiveEvents, etc. LumosJared x11: Premium Rework, Individual Direction, Paperwork. Greenie x4: Isle of Mull. Bertramqaz x4: Silverwind Deco Work. LumosJared x7: Rangers and Processing. LumosJared x16: TrunkStorage, Google Drive Security Perms and Forums Purge, Individual Direction, HR, Meetings, etc. SpunSugar x7: Meetings, HR, Transition Work. Sephite x7: Meetings, Game Leadership, Transition Work. Omnomivore x2, MadamAries x5, mcmann x2, CnocBride x11, Spectriel x7, Winterless x8, lunarepiphany x5: Game Tickets. MadamAries x1, CnocBride x1, Winterless x1, lunarepiphany x1, 65jes89 x6, MokeDuck x1, falconhand x3: Help Chat Responses. Sephite x1, CnocBride x1: Ban Appeals. Omnomivore x2, CnocBride x2: Ban List. Sephite x5, Omnomivore x9, MadamAries x9, CnocBride x39, Spectriel x38, Winterless x36, lunarepiphany x13:Trunk Storage Assistance. Sephite x7, CnocBride x4: Server Transition. GrumpyGirl314 x2: New Server World Assistance. 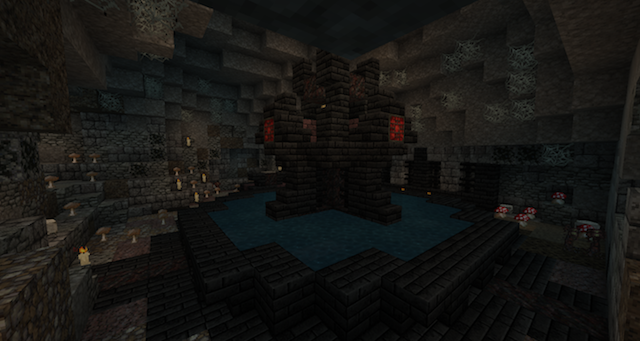 Winterless x1: Essalonia Spawn Building. GrumpyGirl314 x2: Event Diagnosis Sheet. Zacatero x2: Custom Commands Documentation. CnocBride x1: Meeting with SpunSugar. Sephite x2, CnocBride x2, Alj23 x2: CoK Points. CnocBride x3: CoK Weekly Progression. MadamAries x1, Spectriel x1, GrumpyGirl314 x1, Mokeduck x1, Zacatero x1, Falconhand x1: Cups Event. Sephite x1, CnocBride x1, MokeDuck x1, 65jes89 x1: Rank1 Ticket Training. Patsie x3: Estate and Moves. SpunSugar x1: Meeting with CnocBride regarding faction related announcements and transitioning faction specific information to other media hosts (e.g. forums and wiki). SpunSugar x23: Survival posts, transition. TheComputerGeek2 x22: Various Tech Work. CS_Birb x27: Various Tech work. Summer Festival 2018 – Abusement Park Fun! The MassiveCraft Summer Festival is going live! 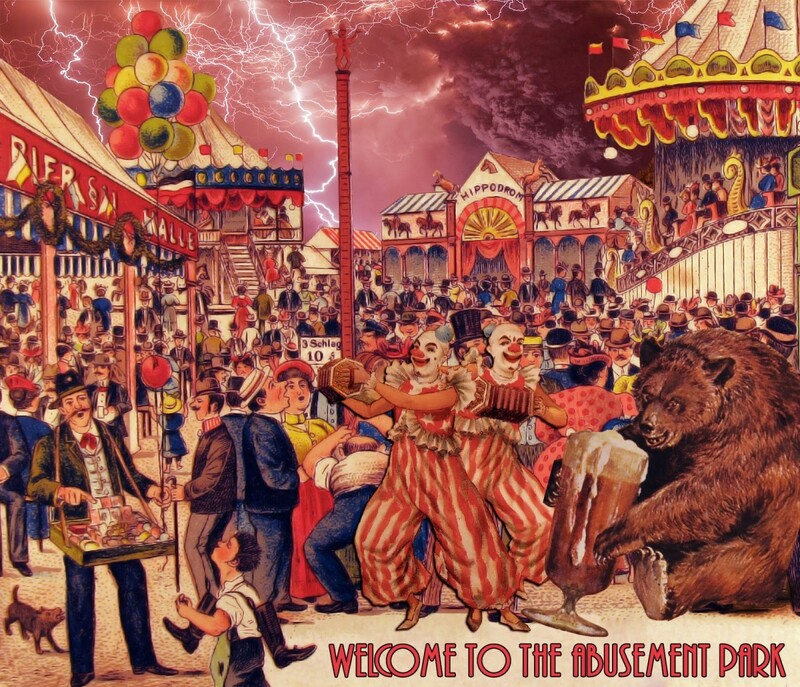 We would like to welcome you, dear player, to explore the latest iteration of the “Abusement Park.” A MassiveCraft tradition spanning five years, Mysterious Dr. Fong’s famous cursed amusement park is now in its fourth incarnation and ready to entertain you for 2018’s Summer Festival! This time, the Abusement Park has come back to Regalia! 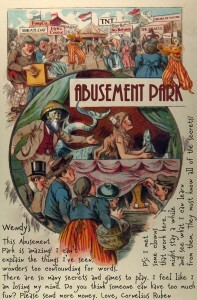 Roleplay in a fantasy carnival setting with slightly dangerous and macabre attractions. Delight in discovering the park’s many strange mysteries and hidden easter eggs. The Abusement Park has been handcrafted for your entertainment by a team of 10,000 maniacs over the last nine months. Each block has been placed with your abusement in mind. We have packed many secrets, hidden dungeons, riddles, parkour, etc. into the Abusement Park. We hope you and your friends will be able to visit the park many times, finding something new on each visit. Shoot the targets: There are twenty-four targets hidden throughout the Abusement Park. Can you find them all and shoot each one with an arrow? Find the treasures: There are twenty-four treasure boxes hidden throughout the Abusement Park. Can you find them all? Solve the murders: There has been a murder! Actually, there have been a whole bunch of murders. Find the ghastly crime scenes and see if you can deduce how the victim died. Unlock the secret doors: There are four secret passwords hidden in the Abusement Park. Each one unlocks a new secret area to explore within the park behind a color coded door. Can you find them all? Finding all four secret passwords will unlock all four chambers leading to the highly secretive Regalian Adventure Club Lounge. Danger-Go-Round: Why would someone build this? Spin around the track with a friend and try to dodge the dangerous hanging obstacles. “The Inferno” Roller Coaster: Sadly, this massive roller coaster has been out of order since part of it collapsed, killing a family of Elves. Ride what’s left at your own risk. Please do not leave your minecart during the ride. Midway Games: So many games and prizes it boggles the mind. Try your hand at the various carnival games. Collect tickets and trade them for prizes at the Prize Shack! Clown Racing: The Abusement Park is home to an underground clown racing circuit. Not much information is available about this unusual sport. Lava Dunk: Drop one of our unpaid interns into a vat of steaming hot magma piped in from one of many geothermal anomalies located under the Abusement Park. The Oracle: (requires an operator present) It is cursed to tell you the absolute truth. You may not like what you hear. Pachinko Machine: (requires an operator present) Bounce the slime ball around the posts to win a prize. The player wins a prize on blue or purple. Dr. Fong’s Patented Love Test-o-meter: (requires an operator present) Use the power of “technology” to find your love connection. A small fee may be charged to pay for testing materials. Aerialist DJs Eel-Man & the BABY: They fly through the air with the greatest of beats. Dance the night away or at least until BABY’s bedtime. Themed Vending: These whimsically themed booths offer delicious treats and fascinating souvenirs for sale. All of the profits from these sales go towards encouraging local Regalian business. Cages of Freaks: Trick and trap your friends into the various “freak cages” scattered around the park. Each one has a hidden entrance that can be activated to capture an unsuspecting victim. Big Top Bar: Take a break and get yourself a foamy beer or a bowl of steaming noodles. The brave will enjoy the hanging “acrobat booths” swinging high above the bar. The Main Stage: You never know what type of performance will appear on the main stage. Will it be a magician? Could it be a mime trapped inside an invisible box? Apply for a performers license and it could be you! The Great Wheel: A slow moving, romantic ride, the Great Wheel offers some of the best views in the park. Large spiders have taken over some of the top supports. Their webs are a great place to try out the webfly trait. The Hall of Heads: The famous mask collection of the Mysterious Dr. Fong is now on display here in the Hall of Heads. Mysterious Dr. Fong is always looking to buy, sell, or chop player heads to better the collection. FongCo© Market: Buy, sell or trade your FongCo© collectible products. New products are released occasionally through our multi-level marketing dealer system. The Ice Caves: Plunge into the icey labyrinth and see if you can complete the maze. Your friends can watch you struggle from outside. Please don’t feed the penguins. Elytra Course: Fly our airship high into the sky and then soar on your Elytra through the colorful hoops. Do you have the aeronautical skills to complete the course? The warp to the beginning of the Elytra course is located near the front gates of the park to allow for quick repeat entry. Besides the main course, the entire Abusement Park has been designed with Elytra flight in mind. There are hoops and secret challenges everywhere! Bumper Boats: Rocket around the lagoon dodging obstacles in your very own wooden rowboat. Sharks will try to sink you to the bottom. Miniature Golf: Like regular golf, but small and fantastic. Throw your chosen ball from hole to hole counting your strokes. Can you get a lower score than your friends while avoiding the obstacles? Explosion Therapy Medicine Show: (requires an operator present) Strap in for the latest in medieval healthcare. A small fee may be charged to pay for the explosives. Drown the Clown: Dump freezing cold water onto the head of one of our unpaid interns. How long will they be able to last? Do you have the guts to find out? The Grotto Room: Cool off in our romantic underground Grotto Room. Sip a cocktail and listen to the gentle music while you relax from the hustle and bustle of the rest of the park. Do look out for sharks. Fongkey Kong 1 & 2: In this experimental attraction, you and a partner will play the game together. Player one runs the course while player two operates the controls. Can you help your partner reach the finish line or will you end their journey entirely? Regalian House of Ooze: Jump your cares away! Worries for another day! Jump your cares away! Regalian House of Ooze! The Wild Wurm Coaster: A small and nauseating coaster. Try not to throw up as you spin around and around. Strange symbols flash past as you do your best not to lose your mind. Dr. Fong’s Attic Adventure: Ride a cart through a replica of various Fong Manors from past maps and versions of Regalia. Search for the proper button to continue your journey. Don’t cheat or bad things might happen. If you have discovered the Gold Member password you can visit Mysterious Dr. Fong’s most inner-office on the final stop of your journey. The Tower Parkour Deluxe: Designed to frustrate the non-expert, only the most nimble will climb their way to the top of this tricksy tower. The Under Park: Who knows what dangers lurk deep in the heart of the Abusement Park? The clowns know. There are many more attractions hidden down below, but we aren’t going to tell you about them right now. Explore at your own risk. By SpunSugar| 2018-06-23T00:09:59+00:00	June 23rd, 2018|News|Comments Off on Summer Festival 2018 – Abusement Park Fun! Introducing New and Improved Crates! Voting Rewards have increased to 10 Regals per Vote! That’s 40 Regals a day for helping your server with just a few clicks. We have also removed the item drops you normally get from voting. However, you will now receive a voting key every four votes! That’s one key a day, with a chance to win an assortment of crates from our shop! Head over to /tp crates and exchange them for a Peasant, Citizen, Scholar, Builder, Marshall, or Emperor crate! We hope these changes make voting for our wonderful community neat, quick, and rewarding for everyone! 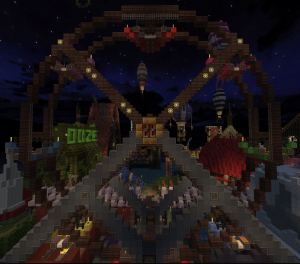 So hop onto the server, type /vote, and show MassiveCraft some love! In addition: a new limited-edition seasonal crate hits the store! The SpringCrate is now available, filled with springtime lore items, for $12.99! Every crate except the seasonal SpringCrate are also possible to receive if you vote! Head in-game and type /vote to get started! Have a Crate Key? Head to /tp Crates to trade it in! Thank you to everyone who continues to support the server through these crates and premium. The staff is dedicated to bringing you new content, and more fun! The Spring Festival has begun! For the next two weeks, MassiveCraft is hosting an event that has tons of surprises, rewards, and ways to engage on the server! We’ve been hard at work creating what we hope will be an enjoyable two weeks worth of activities and fun for the entire server to enjoy! Take a look at what’s in store! Almost every day for the next two weeks, look for player-run roleplay events, surprise pop-up events by staff, and regular server-wide events for all! Check out the calendar of RP events here! The Dragon Festival is in full swing in the town of Meerberg. Help the residents get to the bottom of the mysteries surrounding the strange eggs, or help the population party in celebration of the Imperial Dragon! Head over to /tp festival to start the next line of quests! In addition, the original easter quests have been extended to last through the festival! If you haven’t had the chance to experience them, hop to it! It’s selfie time! When you first arrive at Meerberg, there’s a brightly colored frame available to take some screenshots with friends. Take them with yourself, or group a bunch of your friends together for one giant party shot. Submit your pictures by April 22nd right here! Fighting? In Regalia? Say it ain’t so! Yes, we’re having a PvP tournament at the Spring Festival! Sign-ups are right here. Get excited, get prepped, and get ready to watch some pixelated blood spill! Head over to /tp festival and enjoy! Surprise! Easter Quests are Hopping Down the Bunny Trail! At Regalia spawn, stands a Town Crier from a nearby village, inviting you to enjoy their Spring Festival! 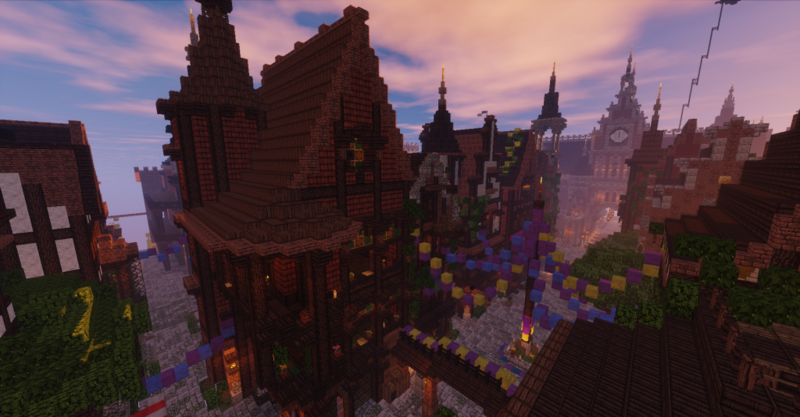 Speak to the Town Crier at Spawn to start the limited edition Easter quests! You only have one week to finish up these quests as the countdown to the Spring Festival begins! 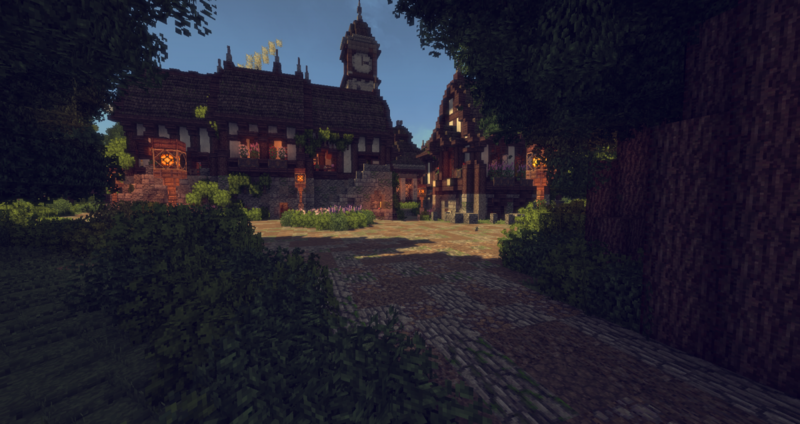 Head to the carriage in front of the Golden Willow Tavern that will transport you to Meerberg! From there, you can complete some of the quests once a day, while some are a one-time-only quest! From the moment you start the quest you will have one week before the quests complete and the festival starts, regardless if you’ve finished all of them, so make sure you hurry! These quest NPCs also have some special colors attached! Questgiver NPCs have an underlined orange name and other NPCs should have a regular, colorful orange name. Once you talk to the Town Crier at Regalia spawn, either head down the road to the carriage, or /tp festival to take part in these limited edition quests! Enjoy this week of fun surprises and great loot! 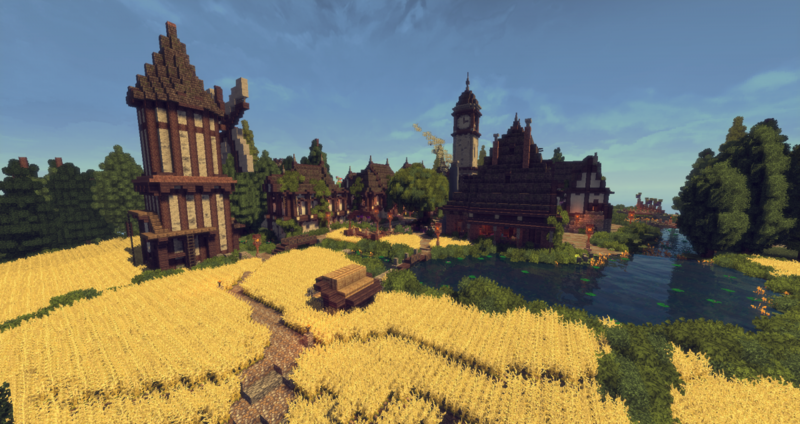 Take the time to explore the town of Meerberg, and get ready for the festival to begin! By SpunSugar| 2018-03-30T20:58:05+00:00	March 30th, 2018|News|Comments Off on Surprise! Easter Quests are Hopping Down the Bunny Trail! The Spring Festival is on the way! 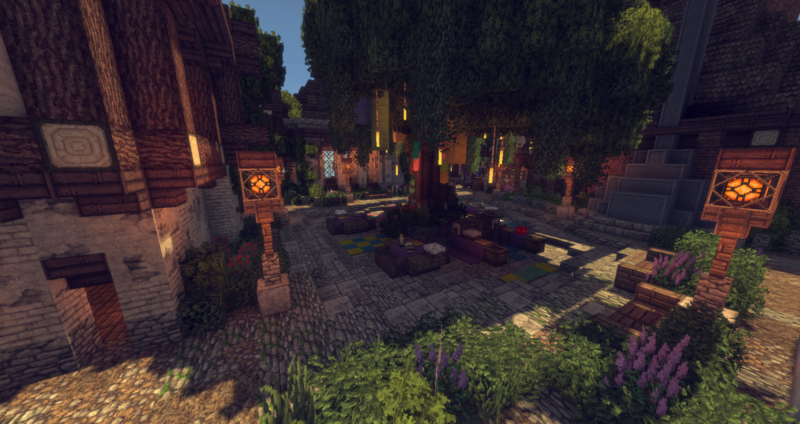 MassiveCraft is proud to host the return of the Spring Festival! This year, it has a very Imperial twist. It’s time for Spring blossoms and surprises. This year we will have activities such as brand new questlines, roleplay events, faction events, and other secrets soon to be revealed! Come along and show your patriotism and pride to the mighty Imperial Dragon! There will be something for everyone to get involved in, as we will be hosting contests and involving our entire community of players with something fun to engage in throughout the month of April! Quests will be plentiful as usual and will be having their own post dedicated to meeting your newest NPCs. There will be many story lines to follow and many creatures to defeat! Shenanigans and ne’er-do-wells will be everywhere in the festival, so be prepared to work hard for some sweet rewards! You can also have your cake and eat it too at this festival! No matter what you like to do, there will be something for you participate in or even host yourself! That’s right, we want you to host an event during the Spring Festival! Enjoy a brand new roleplay site and plenty of staff support! We cannot wait to see you there! Check back often for updates! New Year, New Main Street! Main Street’s New Look is Fresh! 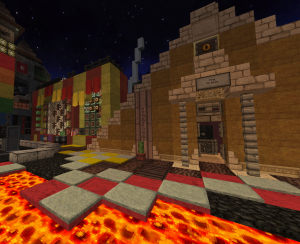 Main Street: the hustling and bustling avenue that is the perfect place to spend your well earned coin. Business roleplay is a hallmark of MassiveCraft. What better way to bring it back to the forefront but to redo the street that is home to so many businesses. 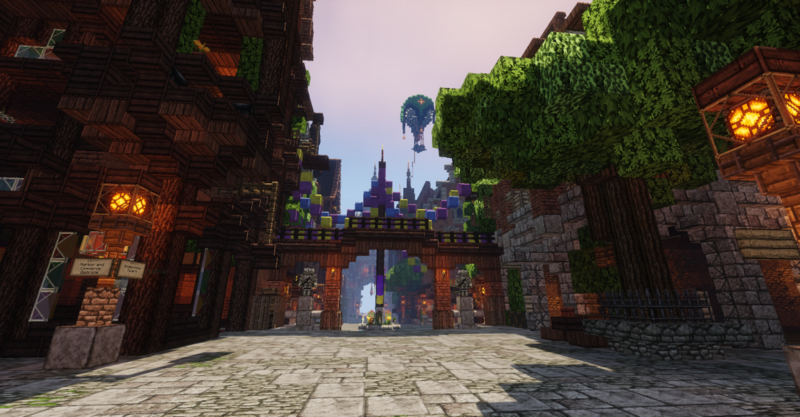 Our ever talented World staff has been working tirelessly to revamp it to be the beautiful business street that it was meant to be. 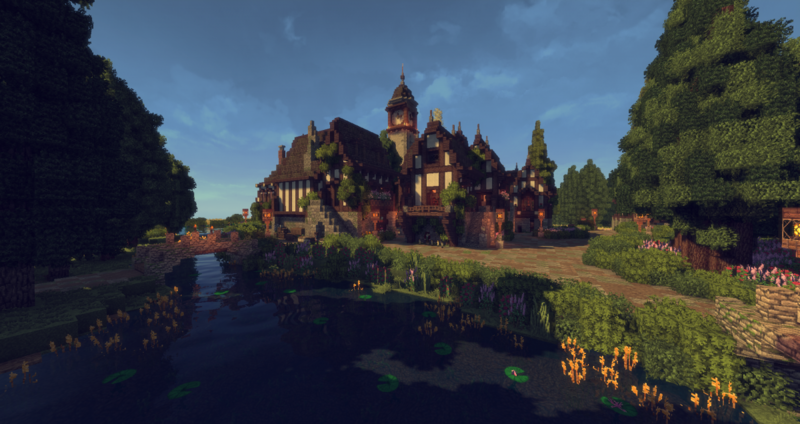 The changes themselves have truly been a wonderful addition to the server and are a very good example of how talented and creative the builders and the roleplayers are on MassiveCraft. Working together to create amazing experience for our entire player base. Each building is quite unique and varies from two to three stories in height and certainly portrays how much hard work those in the World staff put into their buildings. Each of the buildings have a personal twist in order to ensure every player has a special, enticing build for their own business. From a particular set of windows to the way an archway swoops, the buildings have a unique flair to them that makes them the perfect spot for the burgeoning businesses in Regalia! The businesses themselves range everywhere from clinics, to pubs to even a general store! There are some properties still up for grabs so if you or any of your friends have businesses, why not apply for a Main street property? Join in the fun! By SpunSugar| 2018-02-24T18:38:49+00:00	February 24th, 2018|News|Comments Off on New Year, New Main Street! Fair Fountains of Fortune Await! What’s that sound? The bubbling of waters so sweet and prosperous that they call your name? You’re not wrong! For the Quest Department has delivered astounding new wonders to the Factions Worlds. 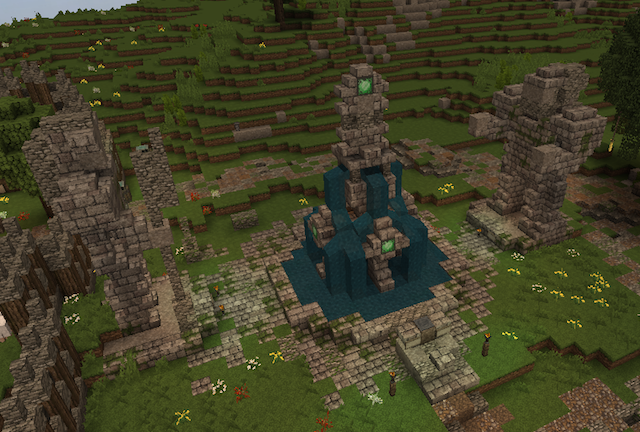 Several fountains have sprouted up in the Faction world spawn areas. These are the Fountains of Prosperity, where adventurers can offer tributes to several races of Aloria in return for unique and delightful rewards! 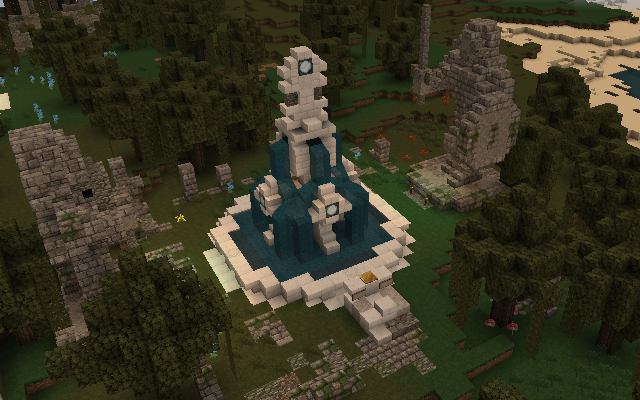 This ornate fountain serves Humans and Dwarves and can be found in New Ceardia. This mystical fountain serves Elves and Orcs and can be found in Teled Methen. This dark fountain serves Vampires and is hidden in Fendarfell. These fountains reward you with various lore items, including sets of racial relics that can be collected to unlock a unique treasure! Not interested in lore items? Players can toggle a reward setting to receive regals instead! One more thing…Hadarian Crown Tokens are back! These tokens can be used for points in Crisis of Kings and you will have a chance of receiving them whether you choose to receive lore items or regals.